The Baktrak Aspen Rifle Sling has a nubuck leather face with accent stitch and a cleated tread grip back that eliminates sling related noise. With heavy duty 1.25″ webbing with swivels tested to 300 pounds, this sling is also one hand, quick adjusting. View More In Gun Slings. If you have any questions about this product by Allen Company, contact us by completing and submitting the form below. If you are looking for a specif part number, please include it with your message. DAX Industries: 550 Paracord Rifle Sling: 2 Point Adjustable Gun Sling With Swivels, Adjusts 34" To 45" Shoulder Pad Included. Adjustable Paracord Knife Bracelet With Flint and Compass Included. 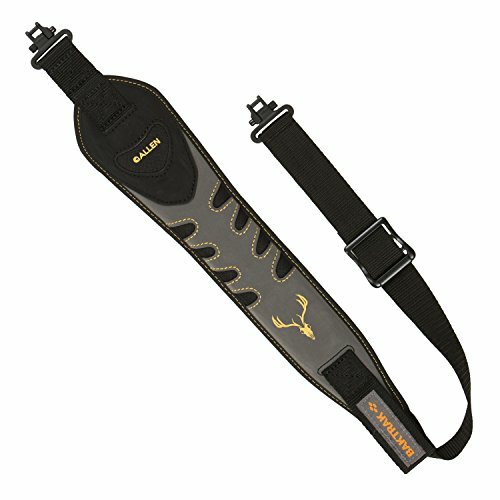 2 Point Rifle Sling, Fits All Guns, Fast Adjuster, Shoulder Pad, Dynamic Straps - BDS 4X Hunting Gun Sling 34"-57"